It isn’t about you anymore. The two little people in my world called the shots on this trip. When they were tired we took a break. We rode the rides they wanted to go on (even if it meant the same one five times in a row), and we looked at the stuff they wanted to look at. Both my husband and I went into this trip not only aware of this fact, but happily followed their lead. Vacation brings on a new meaning. When my husband and I vacationed prior to children we slept in late, got eggs benedict for breakfast, had drinks with dinner, and went to bed late after seeing the sights. 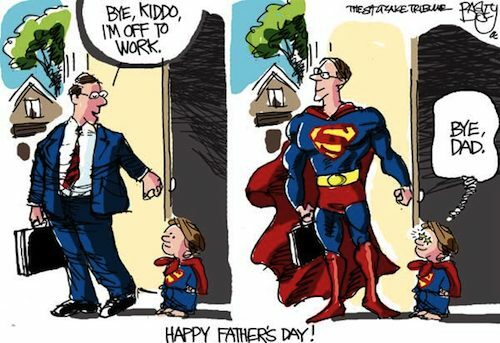 With kids it’s the exact opposite. Early wake up calls, waffles for breakfast, sight seeing till naptime or a meltdown whichever comes first, and dinner that evitably involves using your fingers to eat it. It might not be fancy and no passport is needed, but I can’t remember the last time I had this much fun. Like so many other things in life, it is the small stuff that matters. 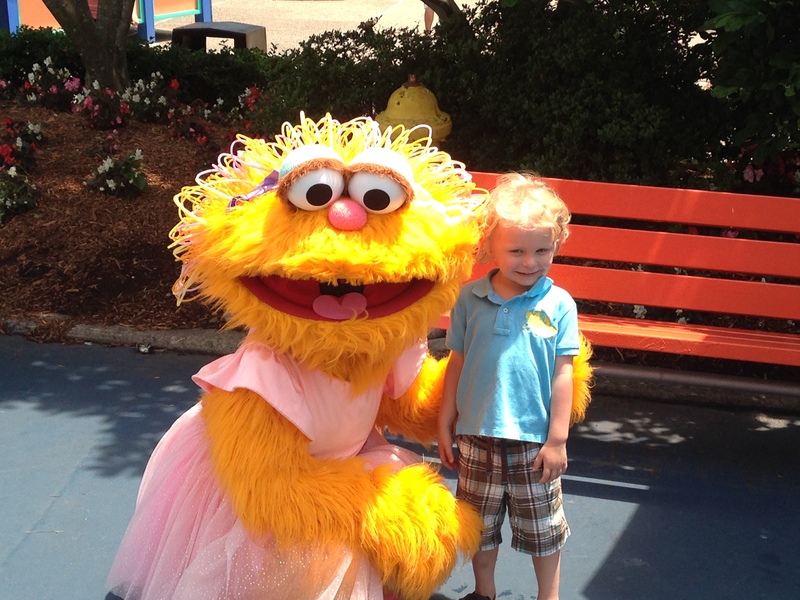 I was so eager to experience Sesame Place with the kids and they loved it. But then there is the unexpected excitement as adults we forget. When we got to the hotel, Liam and Ava ran around excitedly checking it out. On the second day when we needed a break mid-day we drove back to the hotel and went in the pool. They were overjoyed. As adults we unfortunately don’t get too many first time experiences so we tend to forget what it is like, but Liam and Ava quickly reminded me how great it is. There are lessons to be learned even when you aren’t looking for them. 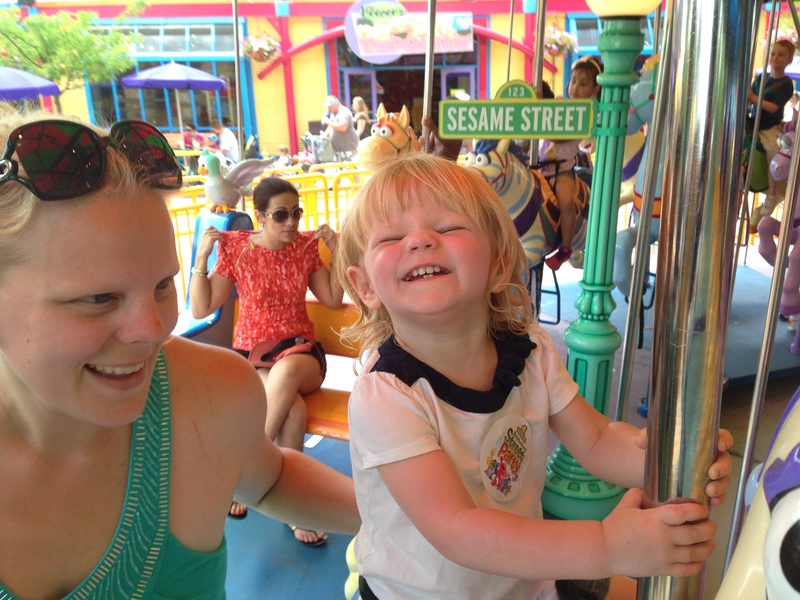 Going to Sesame Place was quite frankly a slam dunk for toddlers. The atmosphere and the whole agenda is geared to them. I had a woman a couple of months ago scoff at me since it was not an educational vacation. Now having experienced this I would argue with her it was an educational experience. Maybe it was not one that ended in learning to read or multiply, but my children were constantly put to the test in patience as they waited on lines to go on rides, share with children in some of the interactive stations, and try new things. It might not be a book education, but I think we under estimate the importance of an education in manners and courtesy. 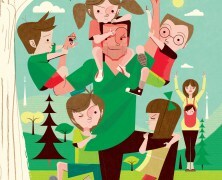 It is Family Fun Time. It was non-stop, all day, all night family togetherness. Now is the time to create the strong foundation of family. If we can establish a close knit feeling now, even when the going gets tough in the teenage years, they will always know that we have each other’s back. I am not going to lie; vacationing with toddlers is not easy. There were temper tantrums, accidents, and full out meltdowns (all which happened in public), but if you can roll with the punches and move past those moments you will discover so many wonderful things. I know that for the kids they had a great time, but for me and Will we created some memories I know we will remember fondly for years to come. I am going to go off topic today to discuss an issue very near and dear to my heart. Tomorrow is coined “The Longest Day” in the Alzheimer’s community. This day honors the 44 million people living with dementia, their caregivers and their families. 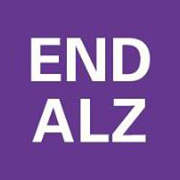 Alzheimer’s disease is the sixth-leading cause of death in the United States and the only cause of death among the top 10 in the United States that cannot be prevented, cured or even slowed. Every 67 seconds someone in the United States develops Alzheimer’s. Sadly I became more aware about this horrifying disease when my grandfather was diagnosed with it many years ago. To say that this disease is not only extremely frustrating and cruel but unfair would be an understatement. My grandfather was an extremely fit man who until the disease progressed along too far walked several miles a day, rode his bike to pay his taxes, and did yard work. For all his physical strength he had, he was mentally sharp as well. An avid reader who read the newspaper daily and did the puzzles within them, declined to the point of being unable to balance the checkbook let alone read an article. It is devastating to see someone deteriorate and change so dramatically. Alzheimer’s disease changes not only the physical and mental capabilities but also the person’s personality. For the loving and supportive family members who are left behind it is at times hard to see or even admit. In early stages of the disease, people may experience personality changes such as irritability, anxiety or depression. In later stages, other symptoms may occur, including sleep disturbances; agitation (physical or verbal outbursts); delusions (firmly held belief in things that are not real); or hallucinations (seeing, hearing or feeling things that are not there). What the disease robs from the person, it also robs from the surrounding family members and loved ones. As you slowly become a stranger to that person you have known all your life it becomes increasingly hard to bear. It saddens me to think how my grandfather really never got to know my precious Liam and Ava. They were robbed of a great-grandfather much too young. 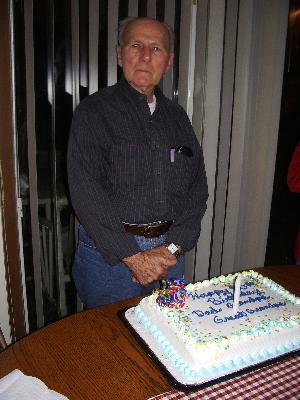 In honor of my loving and wonderful grandfather, David Adley Hague, I ask you all to just become more aware of Alzheimer’s and the many faces it has. I read an article this morning regarding the Westboro Baptist Church holding a protest at the Wilson High School in Washington DC regarding the new principal being gay. As I read the article and looked at the pictures that went along with it many thoughts came to mind for me. Do kids really hate? Or do we teach them to hate things? Liam doesn’t have in his vocabulary the word hate. I do not use that word nor do I like that word. However he has told me he doesn’t like tomatoes . He came to this on his own by trying it (an educated opinion). On the other hand Liam has also told me he doesn’t like pork chops (which I have never made because I do not like them). Since Liam has never tried it before I have to assume his aversion to them is because he heard me say I do not like them (a bias opinion). I can’t help but wonder if these children “hate” a certain sect of people or is it because that is what they have heard so much. There is something to be said in regards to the saying, “Little pitchers have big ears.” So much of our children’s reactions and feelings about things are learned from watching how we respond to things. I really really dislike snakes. I am scared of them. However, I have run into the situation twice now while on walks that we came across one. I don’t want to teach Liam and Ava this fear, so as calmly as I could muster I let Liam and Ava take a look. We are shaped by our surroundings and the experiences we have. Without getting into a religious debate because that is not the point of this post, I can’t help but come to the conclusion hate is learned and is that not the opposite of what any religion would want? I guess my whole point to this is we really need to be cognizant of the message that we are sending our children. Without throwing out too many cliché lines, our future is based on the children of today and I for one would rather live in a future of tolerance and love than prejudice and hatred. I will never forget the day that Will and I witnessed a child being slapped. My body was frozen unable to react to what was unfolding before me. Somehow I rallied and finally was able to calm my then boyfriend now husband down enough to take a deep breath. First let me explain we were at the West Point annual 1812 concert. It is a wonderful event full of great music and fireworks. A couple of blankets in front of us sat a family; mom, dad, and son. As we sat on our blanket enjoying the beautiful summer day, we were people watching when by chance our eyes landed in the same area. I have no idea what transpired prior to it, but the father’s reaction was a full force smack across the little boy’s face. I think I might have literally gasped out loud, however I quickly realized Will was already on his feet; his gut reaction taking over and wanting to do something. I quickly rose myself and pulled Will’s arm, in the opposite direction to take a small walk. It was in that very moment I knew exactly what kind of dad Will would be. From the very beginning I knew Will was good with kids. In college he was a lifeguard and spent much of his time playing with the children at the local park. I have to be honest that was one of the things I fell in love with. It came so naturally and unforced for him. But now here in that moment at West Point I knew something else very important about him, no matter what he would never hit our child. A lot of people have different views on what is acceptable discipline for their children; however an act of violence should never be one. I never understood the theology of getting a child to behave through hitting. It isn’t respect you are establishing through that, it is fear. Your child might not do something again but it isn’t because they understand, it is because they are scared. Some people do not care about the reason as long as the end result is the child does not act up again. To me it is more important that my child understands why instead of living in fear. It still haunts me today about that little boy. Was that an isolated incident (I tend not to think so since it was done so publicly)? Should we have done something? I myself at the time was scared to get involved and maybe we should have. I am no perfect parent by any means. I lose my patience and at times have to leave the room to calm down, but I know I will never ever strike my child to get them to listen, understand, or learn. The only lesson a child will learn from hitting is fear and I promise that is not a lesson you want your kids to live with.